Bacon, eggs, and (yes!) 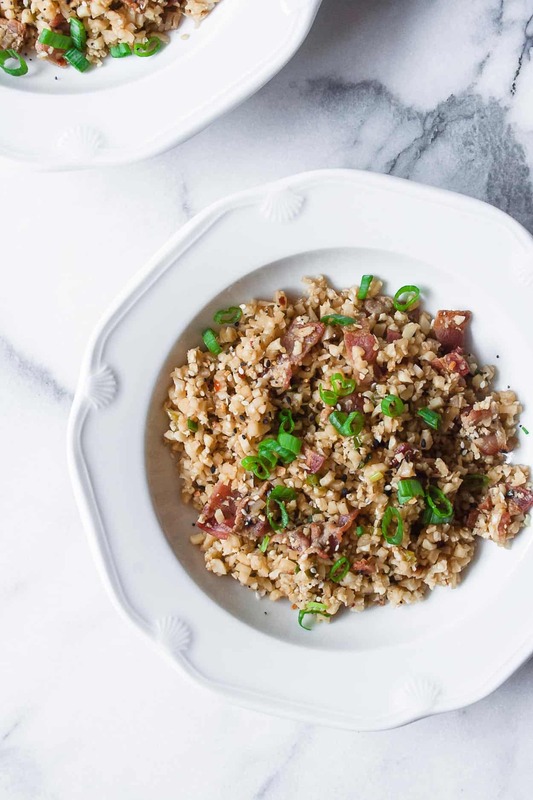 cauliflower go into this comforting Whole30 breakfast fried rice! Easily double or triple the recipe to feed a crowd or meal prep for the week. My mom was in town this last weekend and was asking me questions about the Whole30 – YOU GUYS. I’m so excited, I think I might have convinced her to do the January Whole30 with me next year! Let me back up. On Sunday, we were relaxing around the house and I decided that I wanted to roast a whole bunch of veggies for the week. This is an element of meal prep that I haven’t been super into lately but for some reason decided to do is that day. Anyway, she started asking about the program – what she needs to eliminate, what in the heck do I eat for breakfast, and tips for cooking that don’t force you to eat the same meal 5 days in a row. Roast a ton of veggies for the week – you can add these to any meal. And they come in especially handy for breakfast! Make a big dinner on Sunday night – like a roast chicken! Then you can use the leftover chicken all week long in a variety of ways – on top of salads, in burrito bowls, in soup. The opportunities are endless. Sauces! Man, sauces are the key to switching things up and not getting bored. You could literally eat the same ingredients 5 days in a row, prepared in a different way (collard wrap, salad, breakfast bowl), add a new sauce and it’s a whole new meal. 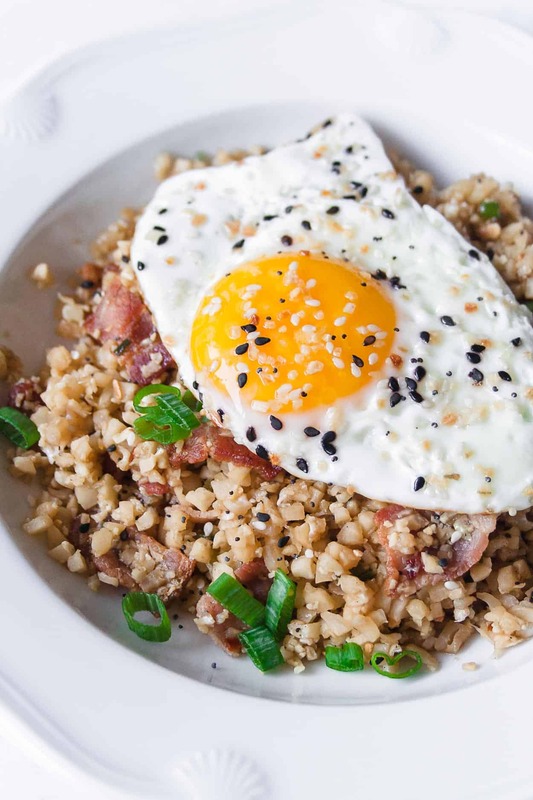 Now that you know my top tips, let’s get to this whole30 breakfast fried rice! 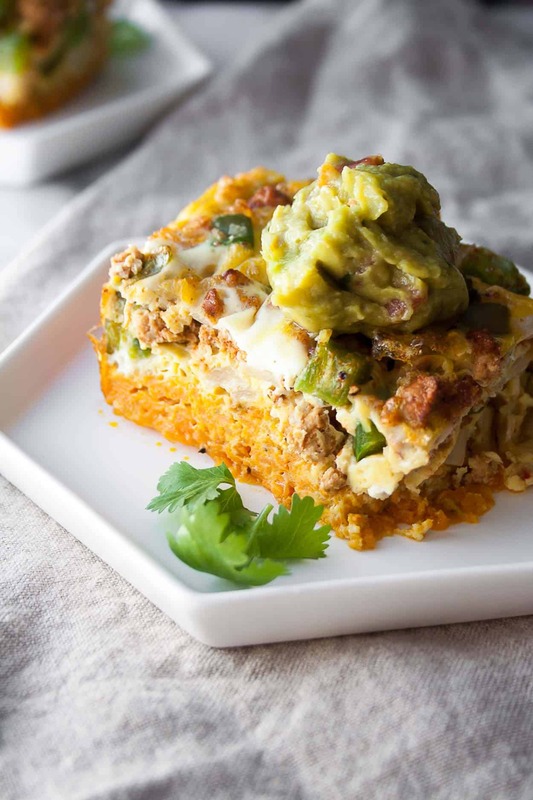 This recipe is one of many Whole30 approved breakfast recipes on this site. And one thing I love about it is that is meal prep friendly! Of course you can make this day of, top it with a fried egg and be set. But you can easily double or triple the recipe, reheat, and top it with an egg the next day! P.S. I highly recommend an over easy egg so that you can use the yolk as a sauce! 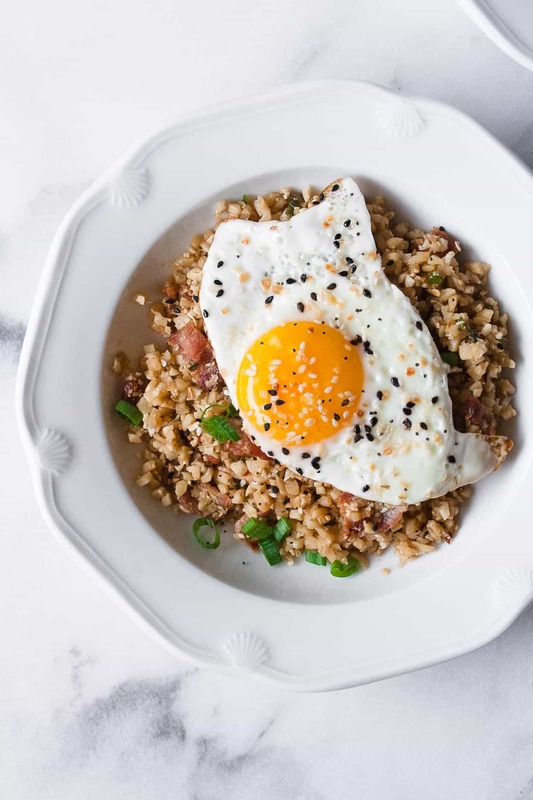 Make this Whole30 Breakfast Fried Rice and post a picture on social media and use the hashtag #imhungrybynature for a chance to be featured! In a heavy-bottomed skillet (I used my cast iron) over medium heat, cook the bacon, turning it until it’s browned evenly. Remove the bacon from the pan and let drain on a paper grocery bag. When cool, roughly chop. In a large skillet over medium heat, warm the sesame oil until shimmering. Add 2/3 of the sliced green onions, and cook for 2 to 3 minutes. Add in the cauliflower rice, breaking up any large clumps. Add the coco aminos, rice vinegar, bacon, and crushed red pepper flakes. Stir to fully incorporate the ingredients and cook until warmed through, about 5 minutes. In a non-stick skillet over medium heat, add the ghee. Crack the eggs into the skillet and cook until the egg white is cooked through and the egg yolk is barely set, approximately 5 minutes. 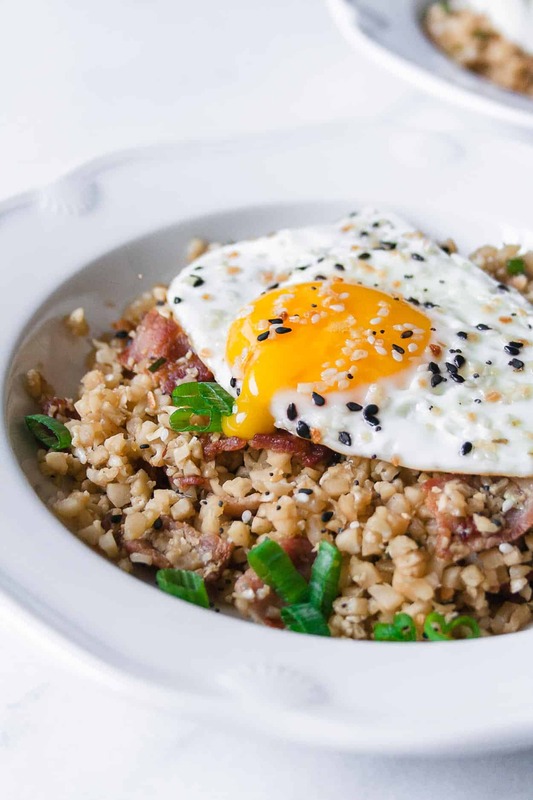 Serve each fried egg on top of each bowl of breakfast fried rice and garnish with the remaining green onion. Serve immediately and break the yolk over the rice so it can act like a sauce! 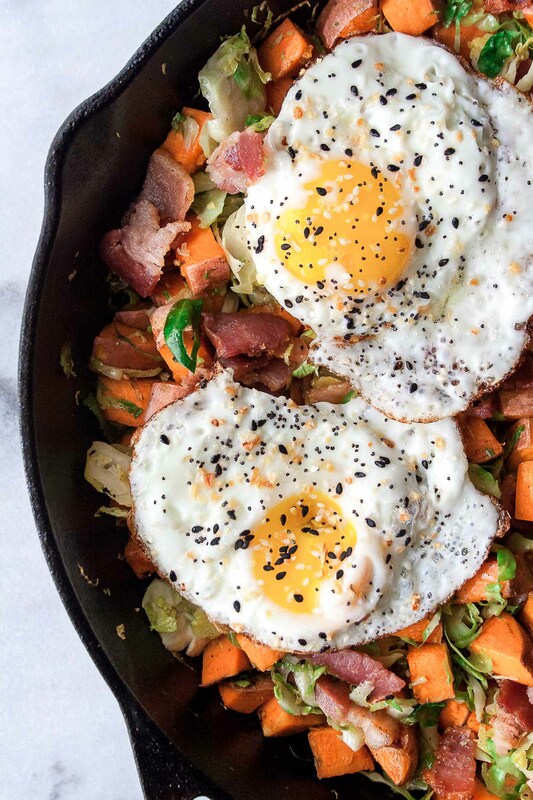 Looking for more Whole30 approved breakfast recipes? These are two of my favorites! Thanks so much Sheenam – let me know if you try it! If using frozen cauliflower rice, should it be defrosted first? It wouldn’t have to be! If using frozen, I would just saute it for a few minutes longer until it softens and cooks through.